I’m pleased to announce the release on September 8th 2017 of Volume 1 of the Complete Solo Piano Works of John McCabe, the initiative of pianist Jane Ford and Steve Plews of ASC Records. The CD (PFCD 054) is issued on his Prima Facie label, and the programme ranges widely, beginning with McCabe’s first published piano work, the Three Impromptus, written in 1959 at the age of 20, and published in 1963 by OUP (now with Novello). The final work on the CD is his last completed piano piece, Berceuse (Study No. 13, written in 2011, a lullaby for a perhaps rather fractious child or restless adult. Between these first and last piano works the programme ranges widely, from the early Five Bagatelles, written to a commission to give students the opportunity of learning some serial music, via Afternoons and Afterwards, a set of seven short works written for students at the higher grades of the Associated Board of the Royal Schools of Music, to technically demanding pieces such as Tunstall Chimes (Study No. 10 – Hommage à Ravel), a study in bell-like sonorities, inspired by the sound of the bells from a nearby village church, heard across orchards and gardens. The short work, Lamentation Rag, was commissioned by the BBC for the 250th Anniversary of the birth of Haydn, and was first performed by John McCabe in a broadcast of similar commissions from British composers to match the earlier French set. The melodic line is derived entirely from the musical transliteration of the name Franz Joseph Haydn, and as the composer explains, the slightly lugubrious title was chosen for two reasons: firstly it seemed to suit the piece, and secondly the Symphony No. 26 (Lamentation) was one of his favourites among early Haydn symphonies. 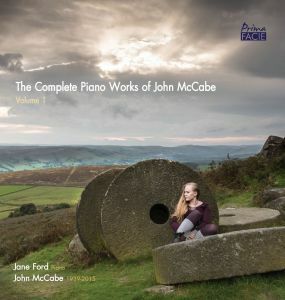 Jane Ford performs all this selection of McCabe solo piano works, which includes six world premiere recordings, with sensitivity, pianistic colour and musical understanding.